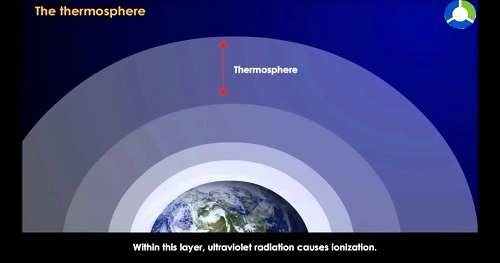 Thermosphere: the region of the atmosphere above the mesosphere and below the height at which the atmosphere ceases to have the properties of a continuous medium. The thermosphere is characterized throughout by an increase in temperature with height. The thermosphere has extremely high temperatures, coinciding with the prefix in its name, thermo, which means temperature. Temperatures can reach over 3,600 degrees Fahrenheit, and the high heat comes from the intense light rays, or radiation, from the sun. Since there is little to no atmospheric gases above the thermosphere, there is no absorption of the heat from solar radiation, and so temperatures soar. Where Does Space Start and the Earth's Atmosphere End?